The riders will start in Kilbroney Park and will follow a section of forest road and natural trail before starting the 24km 'Red Trail' which climbs over Rostrevor past the Cloughmore Stone and through Kodak Corner, no time for camera stops though! The route then traverses the mountain and continues on through tight twisting forest singletrack and boardwalk sections. After a fast swooping and twisting descent towards the top of Yellow River, riders will traverse the river crossing and make a fast forest road descent to Yellow River Bridge. Taking a quick right turn onto a forest road riders will head to a short road section passing 'Santa's Grotto' and exit onto the rugged and stunning valley location used in the TV series ‘The Game of Thrones’, to the bottom of the infamous climb at ‘Leitrim Lodge’. At the bottom of Leitrim Lodge the riders will then climb the 15 – 20min ascent up to Castle Bog and Batts Wall* into the heart of the spectacular Mourne Mountains. Look out for Hodor!! A technical descent over open mountain takes riders back into the forest to re-join the main red trail again which twists, jumps and rails its way back towards Kilbroney Forest Park, via a fast natural rooty forest traverse above the famous Fairy Glen, then on to lap 2 if you are ready for more! Bike Responsibly and Respect the Trails! * Please note that the course crosses private land with public access as well as Castle Bog which is an environmentally sensitive area. We have been given temporary permissions to incorporate this section into the course. We need riders to refrain from pre-riding the course outside of the trail centre sections as we are relying on the good relationship with land owners and keeping our environmental footprint to a minimum. Riding these areas outside the designated race day will jeopardise the ability to run future events! You will have lots of time to ride these sections on the day!! 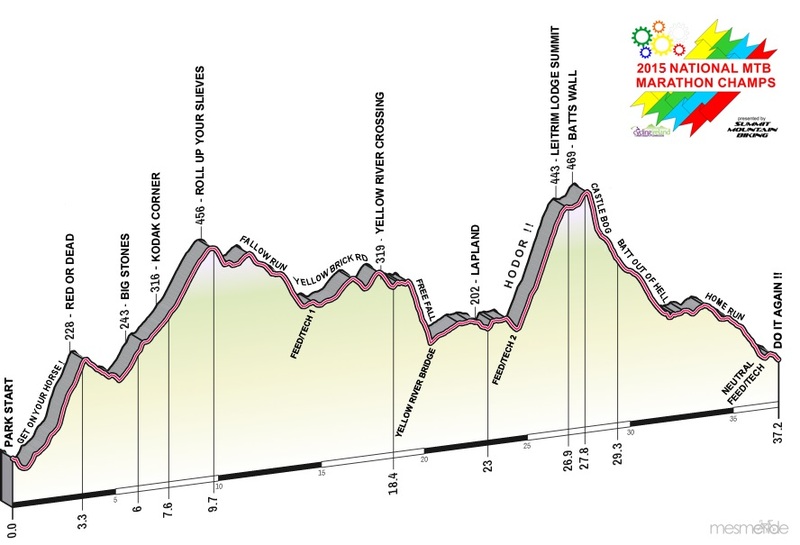 To help plan which Category/Non-Category event is for you, links to the race course map and profile are available below. Please note the course my be subject to minor changes from the published route. Google Earth and GPS ready files are available to download below.